There have been walls standing on the house since May 23rd. That was an extremely exciting day! We have big smiles on our faces today because we have walls that actually LOOK like walls now! I mentioned HERE a couple weeks ago that we were in Danville, Kentucky preaching a youth service for Pastor David Noe and Olde Path Holiness Church. It was a wonderful night. They had food and fellowship after the service and we stayed and visited a little while before driving home. Bro. Corwin Cain and his family were also visiting the service and he asked me before we left where we were in the house construction process. I told him that drywall was being delivered the next week. One thing led to another and Bro. Corwin text me on the way home and told me he was bringing a group of men to hang and begin finishing the drywall one week later! Awesome! The drywall was delivered near the end of last week. I have already posted about most of the preparation toward the end of the week for the drywall. The safe room was block was laid and the pocket door frames were installed. We insulated a few walls for sound, such as these two walls between the bathrooms and the living room and kitchen area. We also insulated the wall between the two bedrooms. On Friday the plumber installed the tub/shower kit in the second bathroom just in time for drywall. Saturday morning Bro. Corwin and his gang showed up ready to work and work they did. We provided pizza and some finger foods for lunch. We appreciate all of these guys working so hard. We had a lot of fun but they drove a long way and exerted a lot of energy to produce all that fun! This is Jeremiah Vaughn, Doc Fox, Jim Bryant, Corwin Cain, Jacob Cain and of course, Odie. 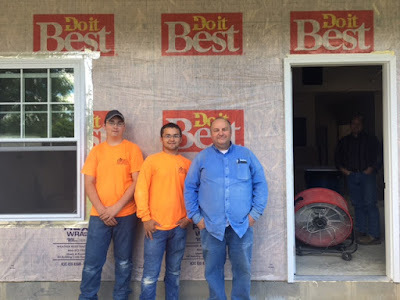 Jim Bryant's brother brought his sons from Rushville, Indiana and worked all day too. Bro. Chuck Bryant in blue and his sons Elijah and Blake. May God bless these men for their kindness and willingness to help us. They gave us a huge boost! Kelly Jo, Lisa Isaacs, Karen Boggs, my Mom and probably a few others served lunch for the guys working, then cleaned up afterward. Most of that same crew plus at least Steve and Deidre tidied up the house and picked up the drywall scraps at the end of the day. It was a successful day because everyone jumped in and assisted wherever they could! Thank you all! Yesterday morning Bro. Corwin and Bro. 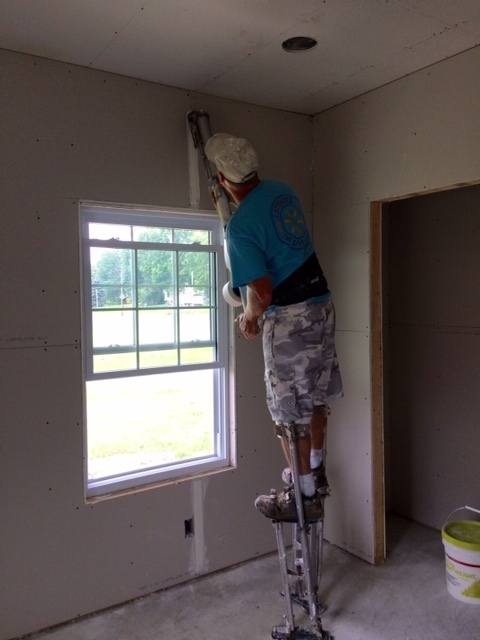 Jim sent John from Williamsburg, Kentucky to finish all the drywall. He is off to a real good start and is planning to be back this morning. This looks like a wall in a house folks! It sure looks like we are going to be ready for paint soon! I will post more pictures as the work progresses. Very exciting! Priscilla and I are keeping up almost daily.